« CCL b2b LOFT – Partisan’s Queer Dubstep Special ! 139 available	 Glove EP Launch - members' ticket £7.00 All tickets are subject to our terms and conditions. 139 available	 Glove EP Launch - non-members' ticket £7.00 All tickets are subject to our terms and conditions. Surprise Glove EP Launch! 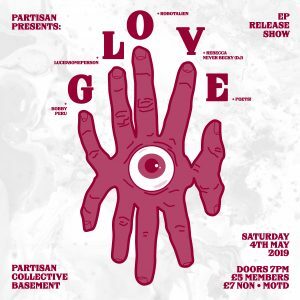 After their epic performance at Partisan back in March, Glove are launching their debut self-titled EP in our very own basement. Glove is collaboration between artists SloSilver and Stephanie Finegan. They are based between Manchester and Bangor, North Wales. Their music is loud, defiant and unique. The duo have been captivating audiences with their incredibly powerful live shows. Between the two of them they use drums, bass, guitar and vocals to create a lively and fluid yet super tight sound. The EP will be released as a limited edition 10″ Red Vinyl (300 copies), and as a Digipack CD with a 4pg booklet via Louder Than War Records. PRE-ORDER: https://louderthanwar.com/shop/cd-albums/glove-glove-10-red-vinyl-ep-copy/ . There will be vinyl and CD copies available on the night. Huge thanks to Lisa Lorenz for designing the poster.